It’s no secret that kittens, puppies and bunnies are sickeningly cute—approximately 75% of the internet is dedicated to adorable pictures of them (or at least it seems so!). But have you seen a cow, pig or chick lately? They’re pretty darn cute, too. Most people have only seen farm animals at the petting zoo or a county fair, so they don’t know how cute, silly, goofy, ridiculous or weird barnyard animals really are. Read on to learn all the things you were never told about the cutest (and most fascinating) farm animals. Goats are probably the biggest weirdos you’ll come across in the barnyard. Why? They love to climb on top of things; they scream like humans (which is really called “bleating); and, most interestingly, goats have unique accents. That’s right. Previously, researchers believed only mammals with larger brains, like humans, elephants and dolphins, could have unique accents. Turns out, goats are just as vocally versatile. Plus, goats’ accents can change as they move between different groups of goats. Cows are udderly adorable creatures. And, of course, they shoulder the burden of generating the world’s ice cream supply. Thank you, cows. So, how do we get these bovine beauties to give us even more ice cream? Their farmers simply need to give them names. Research has shown that if a farmer has a better relationship with her cows—particularly if she names them and shows affection—they’ll produce more milk. Pigs aren’t all just looks, with their cute little noses and curly tails—they’re basically barnyard geniuses too. In fact, some pigs are probably smarter than your human toddler and definitely smarter than your dog. Pigs, toddlers, and dogs probably all have comparable table manners though. Some research has shown that pigs have such high cognitive function they can recognized their names and mother’s voices immediately after birth, remember where they’ve hidden food, and play joystick-controlled video games. We admit it—chickens are not the cutest animals at first glance. But if you spend enough time with them, you'll see that they're so weird looking it's pretty endearing. Plus, they love to cuddle and sunbathe with their chicken pals. Adorable, right? But in the case of chickens, brains trump beauty: They’re able to distinguish between more than 100 faces of other chickens. When was the last time you were able to accurately identify a distance relative? Llamas basically look like stuffed animals, but don’t let their fluffy faces fool you: If you intrude on their territory, they won't be happy. Many farmers use llamas to protect their livestock because they’re extremely alert and aren’t afraid to chase an intruder away. It may be worth getting chased by something so cuddly and goofy looking though. Watch a horse gallop across a field while the sun is setting and try not to shed a tear. Just imagining it is probably getting you choked up. Horses are freaking beautiful, majestic animals, and they’re super expressive, too. They use vocalizations, like whinnying, neighing or snorting, as well as their eyes, ears and nostrils to express their moods and feelings. Horses get all the majesty and grandeur of the family Equidae (or the horse family), but donkeys are pretty dang cute, too. Plus, they’re like a wise, all-knowing mom. How? Not only can donkeys remember a place or another donkey (or something you did as a dumb teenager) from as long ago as a whopping 25 years, but donkeys also won’t participate in activities if they seem unsafe. Everyone loves sheep for their warm wool and their heroic deeds in the movie Babe. Their goofy, blank stares are also pretty endearing, but if you look closely into sheep’s eyes, you'll see they're not as creepy as they seem! They have horizontal pupils, which offer them some protection from predators. How? 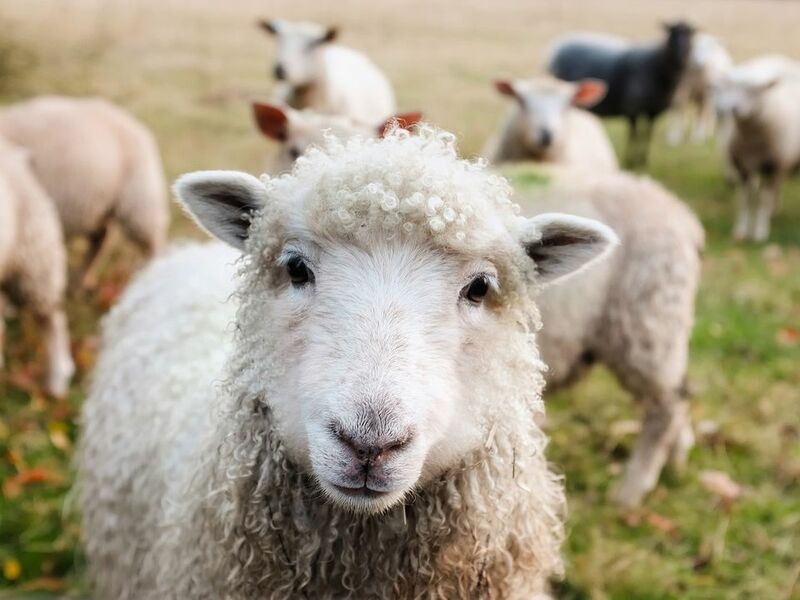 They can see all around themselves—not just what’s in front of them—which is necessary in an animal whose only defense mechanisms are bahhhh-ing and running away.